Dr. Collins joined AEC in 2011. She has a BS in Biology from Eastern Michigan University (2005) and obtained her Doctorate in Veterinary Medicine from Michigan State University (2010). She completed her Small Animal Rotating Internship at Veterinary Specialists and Emergency Services in Rochester, NY. She is a member of the MVMA, AVMA, IVECCS and SEMVMA. 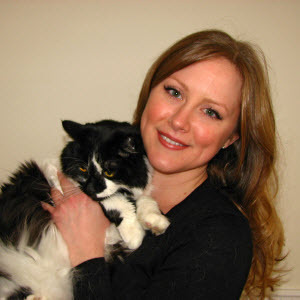 Prior to veterinary school, Dr. Collins worked as a veterinary technician for 8 years. She has a strong interest in surgery, continuing education and client education. "I enjoy the persistent challenges and learning experiences encountered in veterinary medicine. I am very compassionate and care deeply about each animal and their owners. It is important to me to ease the often unexpected and stressful situations that bring owners and their pets to our hospital." Dr. Collins personal interests include fitness; camping; poker; knitting and other crafts; and family and friends. She has 3 cats (Carl, Kevin, Chulo), 1 dog (Jesse) and a Mexican Red Knee tarantula (Rosa).